For the last 10 months I have been keeping something a secret. It started in October last year and I worked so hard through the year to get to this point. I am tremendously excited to finally share this news. Okay, I finally said it out loud. It’’s called Momentus: Small Acts, Big Change. No, that is not a typo, let me explain. I have always believed that if there are many of us making small actions, it will lead to big change. The title of this book grew out of this idea. When all of our actions are added up, the impact will be momentous and we will change the world. It is about all of us and all of our moments when we are inspired, passionate and moved to act – momentus. It’s something that I learned really early on – everything counts and everyone counts. I believe that we all have the capacity and responsibility to create change. I don’t care how old you are or how young you are, where you live or how much money you have. The ability to create change does not discriminate, it’s in everyone. Momentus backs this up with real-life stories, lessons and inspiration. If you’ve been reading my blog or follow me on social media, you know that role models are a big deal to me. For me, role models are those people who have set a path and have proven that “it” (whatever your “it” is) can be done. I have always been so interested in people’s journeys and the paths that they took. I love to hear about how they discovered their issue and how they began to take action. I love to learn about the steps they took, the obstacles they faced and the lessons they learned along the way. I wanted to make this idea come to life in my book. I interviewed 19 of my role models who have each created change locally and globally. They have taken on issues that include: the environment, bullying, poverty, education, indigenous rights, homelessness, inclusivity, mental health and empowerment. I interviewed these people wherever and however I could. I sat down with Mitch Kurylowicz at a Starbucks. Technology proved to be very helpful when I Skyped with Corinne Hindes from her home in California and with Muzoon Almellehan from her home in the UK. I Facetimed with Lily Collins and one afternoon, I got a call from Lilly Singh for our interview. These are people who inspire me with their passion, issues and accomplishments and I truly believe that they will inspire you too. My two biggest role models are Marc and Craig Kielburger, who have been with me from the very beginning. They have taught me that you are never too young to change the world and that you cannot do it alone, and many other things. I am so proud and honoured to call them my mentors, friends and now, ‘the writers of the foreword to my book”! It means the world to me that they have the first words. My greatest hope from this book is that people finish it and believe that they have the fullest power and capacity to make a difference. Then, they go out into their community takes action. I cannot tell you how excited I am to see how people create their own change. Anyone who knows who I am knows that I love social media and I know that it is the platform to spread awareness about things you care about. So, of course, the official hashtag for the book is #Momentus. I hope that you’ll join me and share your moments. 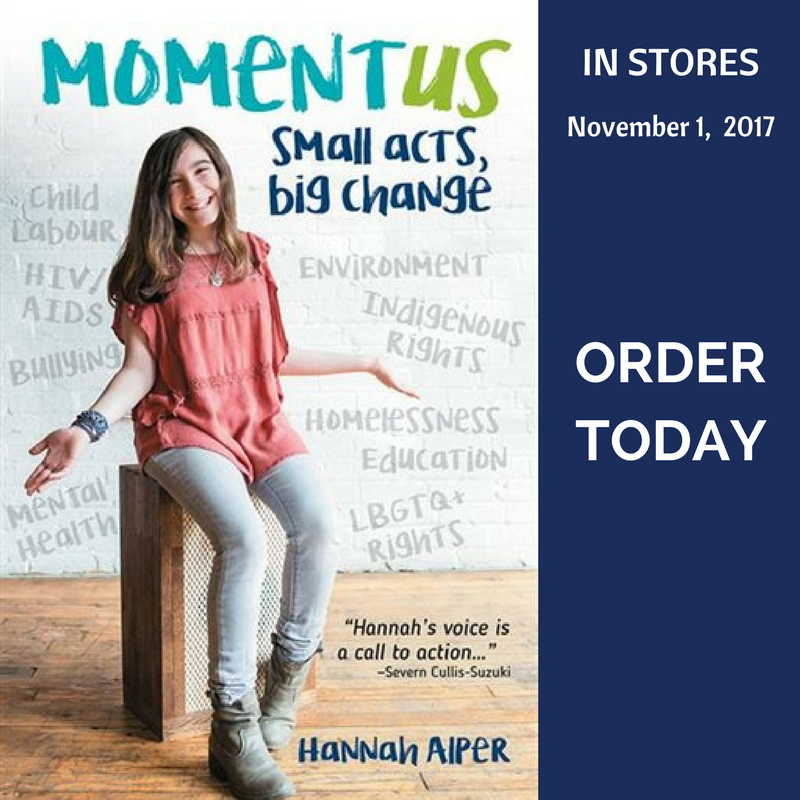 Momentus will be on the shelves of bookstores across Canada on November 1st and you can pre-order your copy (or one for someone else) online at Amazon and Indigo. Hello Hannah … Saw your interview. You are a wonderful young lady and an amazing role model!! I have a grand daughter who turns 14 this week and I wondered if your book is available and how i would order it?Have fun on “WE Day”!! Thanks! Hi Maureen! I am so happy by you and your interest, I’m so overjoyed that I can spread my message and passions. 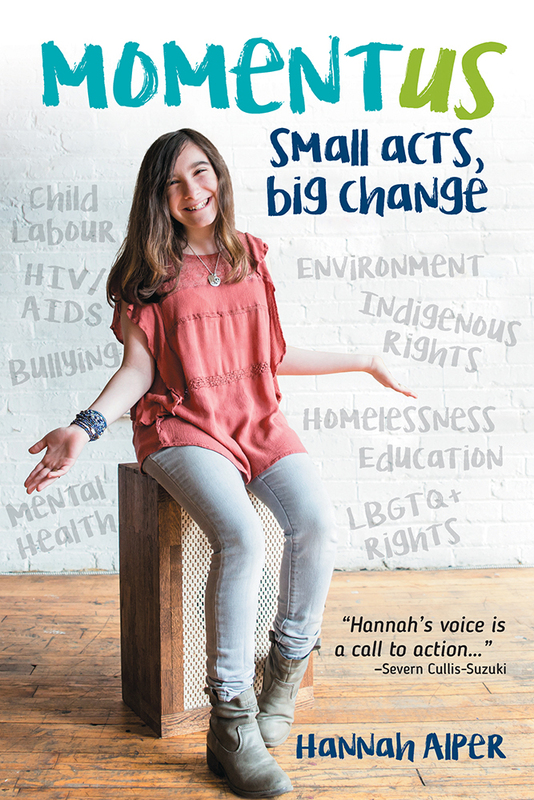 You can order the book at http://www.bitly/Hannahbook or by searching it on Amazon. Thank you! I saw your interview on City news a while back. I just purchased your book to give as a Christmas gift to my 11 year old niece. She is a spectacular young lady ( like yourself) and I am very excited for her to read it…..I would like to read it as well. I saw your interview on chch morning news with Bob Cowan. I was so happy to see hear you talk about the importance of role models. I agree, that role models are a great source of inspiration. I picked up your book for my kids (ages 10 and 13). I read your book and you actually inspired me to continue my business and to step further out of my comfort zone in order to create positive change in society. I have created Willow Tree Parenting (www.willowtreeparenting.com + willow tree parenting (youtube). It is a business that help parents navigate their roles in this digital age. I felt like giving up last week, but I am back on the horse. Your book reminded me about how important technology awareness is and that helping parents on this topic is important. Thanks for being one of my role models. I hope to share a stage with you and other great change activists one day!!!!! :) You are amazing!